Concealed trapway facilitates easy cleaning and enhances design. Glenbury Quiet-Close seat with Quick-Release functionality allows seat to close quietly and quickly unlatch from the toilet for easy removal and convenient cleaning. 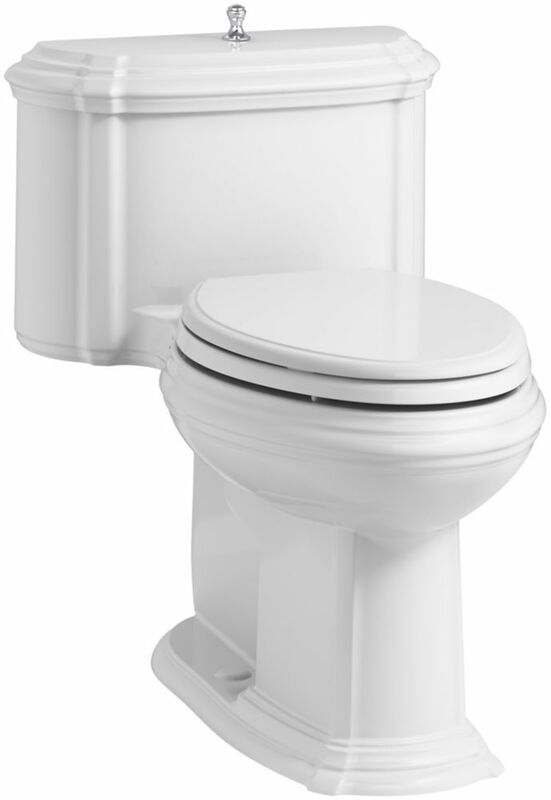 Portrait 1-Piece 1.28 Gpf Elongated Toilet With Aquapiston Flush Technology In White The Portrait collection draws its inspiration from the understated sophistication of French Provincial design. With its sculpted lines and soft edges, this Portrait toilet reflects the contours found in traditional furniture yet is versatile enough to fit many bathroom styles. The sleek one-piece compact toilet comes with a gentle-close seat and lid that detach for easy cleaning. A 1.28-gallon flush provides significant water savings of up to 16,500 gallons per year, compared to a 3.5-gallon toilet, without sacrificing performance. This toilet features innovative AquaPiston(R) technology, a patented flush engine that delivers a fast, powerful, and virtually plug-free flush. Portrait 1-Piece 1.28 Gpf Elongated Toilet With Aquapiston Flush Technology In White is rated 5.0 out of 5 by 10.